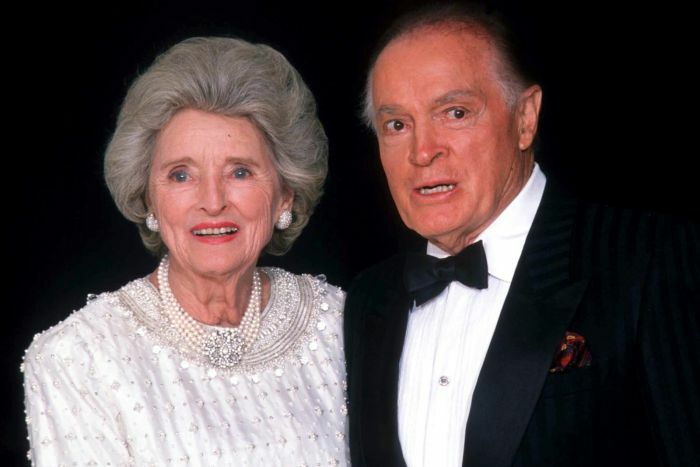 Life and Death of Bob Hope – Net Worth, Children, When and How Did He Die? Bob Hope was a versatile entertainer who excelled in showbiz and Media entertainment in a career that spanned more than 80 years. The veteran entertainer made the Guinness World Book of Records as the most Honored entertainer, bagging more than two thousand awards and over fifty honorary doctorate degrees. Bob was born Leslie Townes Hope on May 27, 1903, in Well Hall, Eltham, County of London, the United Kingdom to an English father, William Henry Hope and Welsh mother, Avis Hope. His father was a stonemason while his mother was a light opera singer and later served as a cleaner in a bid to make ends meet. He was the fifth son out of seven his parents had. Hope spent his early years in the UK where he was born. In 1908 when he turned four; the family immigrated to the United States where he grew up in Cleveland, Ohio. It was not all rosy for Hope’s family when they moved to the US, he didn’t waste any time to hit the street at age 12 as he began to sing, dance and crack jokes in public and solicited for arms thereafter. He made appearances in dancing and amateur talent contest which saw him win a prize in 1915 after impersonating Charlie Chaplain. Bob passed through Boy’s Industrial School, Lancaster, Ohio. Before venturing into boxing in 1919, he chose Packy East as his ring name during his short career in boxing where he won three fights and lost one. When he left boxing, he engaged in all manner of menial works to make money. Hope’s tentative entry into showbiz was with his girlfriend, they signed up for dancing lessons to enable him to improve in his dancing steps. Following Bob’s progress, they paired and performed in local vaudeville theaters one of which was in a three-day engagement club where he teamed up with his dancing school friend Lloyd Durbin. He would go on to meet the likes of George Byrne and the Hilton sisters and had a couple of shows with them. In 1929, he changed his name to “Bob”, after his love for a car race driver named Bob Burman. Bob Hope later established himself as a solo act, he began to appear on stages in vaudeville shows and Broadway productions, establishing himself as the king of the one-liner. Bob held sway on Radio till the 1950s when television started becoming popular. He continued his exploits on television shows where he hosted the Academy Awards for nearly two decades. The first movie the comedian featured in was titled The Big Broadcast of 1938, it starred W.C Fields. Bob then went on to feature in well over 52 films. He was a nationalist who entertained American soldiers during World War II, he made radio broadcasts to honor and support the soldiers and it did not end there. Hope embarked on tours with the USO performers to bring undiluted laughter and entertainment to the US military personnel scattered all over Europe spending most of his Christmases with the soldiers alongside his wife. In 1968 following his selfless service to his country especially through the USO, United States Military Academy awarded him Sylvanus Thayer Award. He was warmly recognized with several Awards numbering about 2000 with honorary doctorate degree awards numbering up to fifty. According to The Guinness Book of World Records, Bob Hope was the most honored entertainer in his lifetime. As a successful entertainer and media guru with a long career, Hope saw wealth and commanded it. By the time he passed away in July of 2003, his net worth was said to be $150 million. Though the figure did not include his real estate sold in 2016 for $13. Bob married twice during his lifetime; he married his first wife, Grace Louise Troxell on January 25, 1933, when he was 30. Grace was a secretary from Chicago, Illinois, born in 1912 to Edward and Mary Troxell, the marriage lasted a year as they divorced in 1934. In the course of his career, he met his would be the second wife in 1933, a singer and actress, Dolores Reade, the following year; she was one of his co-stars on Broadway in Roberta. They got allegedly got married in 1934; performed together in showbiz and traveled on tours entertaining US troops. The couple had a very happy marriage and became the talk of many people. Dolores was born on May 27, 1909, in New York to Jack and Theresa DeFina. She is of Italian and Irish descent. Her father was a bartender while her mother served as a saleslady in a dry goods store. Delores started as a model before venturing into music when she met with Bob Hope. Bob Hope together with Dolores had a total of four children whom they adopted; their first child (a daughter) named Linda was adopted in 1939, the second one (a son) named Tony was adopted in 1940, the third child (another son) named Kelly was adopted in 1946 while the last one (a daughter) named Eleanora but known as Nora was adopted in 1946. Tony was a presidential appointee in George H. W. Bush’s administration as well as that of Bill Clinton. Dolores, however, died 8 years after her husband’s demise on September 19, 2011, at the ripe old age of 102. Their children have given birth to many grandchildren to carry on the family name. Bob Hope, while he was alive was among the small group of entertainers to celebrate their 100 years anniversary. However, in the year 2000, he was hospitalized and was treated for gastrointestinal bleeding, after which he got discharged. The following year; he spent almost a fortnight recovering from pneumonia. On July 27, 2003, the legendary entertainer gave up the ghost at his home in Toluca Lake, California. His remains were laid to rest on the grounds of Hope Memorial Garden at San Fernando Mission Cemetery, Los Angeles.